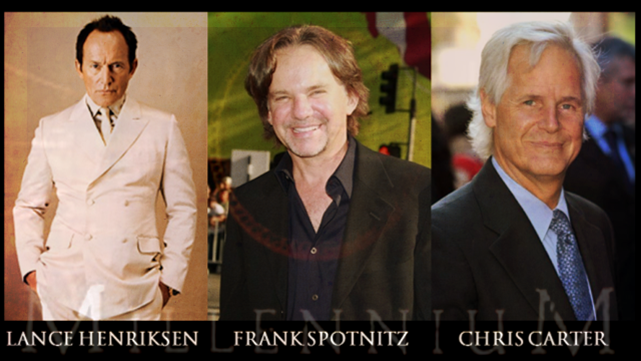 BACKTOFRANKBLACK.COM: Make or Break: Chris Carter, Frank SpotniTz, and Lance Henriksen talk about Millennium's future! Make or Break: Chris Carter, Frank SpotniTz, and Lance Henriksen talk about Millennium's future! This is the big interview! This is Lance Henriksen, Chris Carter, and Frank Spotnitz talking about the future of Millennium. Is there a future? Listen to the podcast and find out how this conversation has shaped the future of this campaign! Don't miss this! To download click this link! 19 Responses to "Make or Break: Chris Carter, Frank SpotniTz, and Lance Henriksen talk about Millennium's future!" Great interview, I agree that it would be best in a high quality TV format. Like a event TV show, hopefully followed by a full series. Must go out and buy the DVD's now! Have been looking forward to this for weeks! Thanks for making it happen! James! THAT intro was amazing! AmAzing! I also liked the stories before the intro. All the effort you guys put into this campaign! "Lance never let it go". sigh. My heart goes out to him. The way he told Chris ..<3 like "I just want you to know I still care". So interesting what these 3 said about the current state of 'worldly things'. great moments there. So agree on the *nostalgia* part. It also goes for The X-Files. I would love to see them do what they suggest to do with this transformation of Millennium! Sounds great! Ah! On the creepy fan side: Love that Frank is in London! fingers crossed for his projects! Wall Street Journal, huh? Think I'm gonna add that to my list. Frank has always such a great way of putting things into words. It's why we love so much of his work. It's amazing. One reason why I was looking forward to this so much. @Darren and @Traumcave...thank you both for taking the time to not only listen to the podcast, but leaving a comment as well. Unfortunately because of work, I was unable to be part of it, but I think it went over quite well and I can tell a difference with Carter from the first time we interviewed him that he wants to revisit Millennium again! Great interview! Glad it all came together. While I think a feature film would work, TV is not a bad option at all! great interview! now we have a new goal -- FX!!! and they actually answered my question, which was about the current state of the world! ditto to all of traumcave's comments. What a way to start 2011. Thank you for the great interview. Congratulations on a job well done, that was quite interesting. At least it's some promising signs for the future. It will be interesting to see what unfolds for this website, if, or when, the film get's a green light. What an AWESOME podcast, FANTASTIC, I am so excited. Yee ha yippee !!! Congratulations on one more success in a long string of successes by the BTFB team! So Chris Carter is not done with the Frank Black character after all these years, that is really good to hear! I must say the TV-movie event or the direct-to-DVD movie solutions really do make a lot of sense. It's the best compromise between the artistic vision Carter would have and the (low to medium) budget FOX/FX would allow on such a dark and difficult universe as the mind of Frank Black! Troy and James: What a terrific job you did getting this together, and conducting the interview. Thank you so much for arranging this great moment in Millennium history, and let me know how I can help the cause. It was simply amazing to listen in on Carter, Henriksen and Spotnitz as they discussed their love of this great program as well as possible paths to a reunion. Thank you for making this happen. And thank you for doing such a great job. Wow. I've been busy and haven't been able to listen to the podcast until this morning and now I'm going to be up for a week because of my excitement. Amazing podcast!! So great to hear that Spotnitz and Carter are still willing (I asked them two years ago in person and they said they would be interested) to revisit Frank Black. I've "liked" FX on Facebook and am waiting to hear from you all on how we're going forward to get a Millennium movie made!! I think FX is the best place for the show. I know Lance talked recently about the "language" issues and how in a movie allot of the restrictions would be removed. However, I think the same barriers would be removed if the show was placed on the FX network Vs. Fox. Lovely to hear from you Mark! And yes, FX looks like the focus. We'll be outlining our approach on the campaign very shortly. We felt best to let the podcast sink in first before we pushed forward with a plan. That will change! ...And we would be ready to listen, Mr. Snow! Thank you for weighting in! I second what akbrowncoat said: FX would be a good place for MM. They proved they can handle a ballsy and gritty show with "The Shield", which was one of those rare shows that pushed the envelope in television storytelling. Great Podcast! Thanks for filling in the gaps, James. I was a little worried in the beginning when the Lance's and Chris' comments about the stock market and the like seemed to fall a little flat. I could feel the intensity of the conversation. Lance was very passionate. It looks like your efforts thus far have been working!